Saya's legs came from this one probably one of the few scans where she's not holding a sword >_>, sword from here and Haji scan from here. 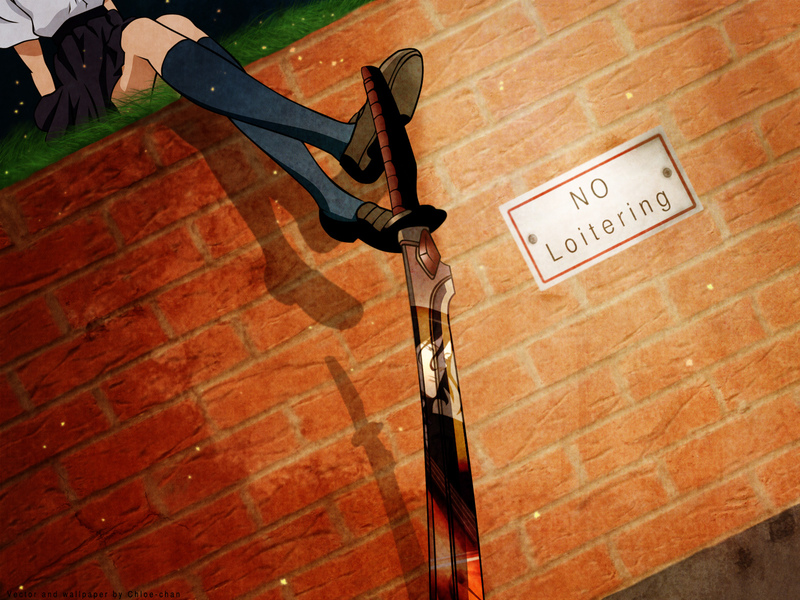 Saya and the sword were vectored as was the "No Loitering" sign. Oh, and I dunno about the perspective... I tried my best to get it right. And the shadows of the sword and Saya's legs might not be right. Textures from DA! and Mayang. I like the idea and perspective of the wall! I only have one thing to pinpoint! first of all, i Love the idea! its really cool! Great idea you have here, the perspective is simply genius! I see your artistic ability came out on this ... It's pretty simple, I like the textures and all the little details you notice. I think the grass sort of kills it a bit, but it's too original to pass up such a little detail. Nice work, and keep walling! well done on the loitering wall but i guess that is to be expected hahah later. how do you always come up with creative ideas chloe-chan?I really have no idea. Damn you and your wallies! The vector is amazing, as always! Always refreshing to see a work done by you... it always amazes me how you like to play with different views and perspectives. Plus you've done a great job as usual with the vector and texturing. No prob about the dark wallie... but only because you did this awesome one instead XD but still you have to do a dark one. I like the concept, it's brillant. And beside that, I love the texture like always. heheheh! the concept is kinda funny! Gah~~~ nice concept! XD Ooooooh chloe-chan does it again with her nice vector walls of concept... ! Get vectoring nightmares you will X-P Heeheee, amazing piece of work~~ keep it up! wow great wall. nice concept again another awesome piece of work from you! Again, I love the idea of this wall. And then it's Blood+ so it's just great. Nice original perspective. Haji's reflection on the sword is an especially interesting touch. Like bluSake wrote I find the reflection Haji on the sword particularly interesting.